With so many varieties available, clients are sure to find one they can enjoy to boost their calcium, vitamin D, and potassium intake. According to Shari Steinbach, MS, RDN, president and owner of Shari Steinbach & Associates, LLC, a nutrition and culinary communications consulting firm in the greater Grand Rapids, Michigan, area, supermarkets may shelve hundreds of yogurt varieties. "When I worked in retail, our supermarket had 500 different varieties of yogurt in the case!" says Steinbach, who works with the United Dairy Industry of Michigan. With so many yogurt varieties available, it's easy for consumers—and even health professionals—to be overwhelmed. 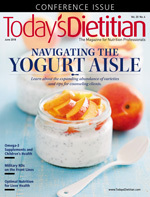 This article will define yogurt and provide an overview of associated health benefits; describe the various types of yogurt, including French, Greek, Icelandic, kefir, Australian, traditional, and plant-based; and provide strategies to help clients and patients navigate the yogurt aisle. Plant-based yogurt may be fermented using S thermophilus and L bulgaricus; however, there's no FDA standard of identity. "This is also representative of consumers' increasing desire for less processed, more wholesome foods and the trend toward higher-fat fad diets such as the ketogenic diet," Steinbach says. The trend toward whole-fat dairy can be a challenge for dietitians when counseling clients on yogurt selection. The DGA recommend limiting the intake of calories from saturated fats to less than 10% per day. This recommendation is based on evidence that replacing saturated fats with unsaturated fats is associated with reduced risk of CVD. However, a meta-analysis conducted in 2017 showed no association between dairy products, whether low fat or full fat, and CVD, coronary heart disease, or deaths from any cause,10 according to Rahaf Al Bochi, RDN, LDN, CDE, owner of Olive Tree Nutrition, a nutrition consulting practice specializing in diabetes, weight management, and wellness nutrition in Atlanta and media spokesperson for the Academy of Nutrition and Dietetics. There's also research showing that high-fat dairy consumption is associated with lower risk of central obesity compared with low-fat dairy.11 Al Bochi believes there may be some benefits to full-fat dairy. "High-fat dairy products may be more satiating, which may lead to less snacking throughout the day. Furthermore, low-fat dairy products usually have more added sugars than full-fat dairy products to compensate for the taste. There's no clear-cut answer to full-fat vs low-fat dairy," Al Bochi says. Steinbach adds that most consumers won't choose a product higher in fat and calories or one they don't enjoy the taste of, no matter how many nutritional attributes it touts. A walk down the yogurt aisle can feel like a visit to the United Nations. There's Australian, French, Greek, and Icelandic, and, according to Steinbach, consumers will soon see Vietnamese yogurt. Then there are "free-from" yogurts—GMO-free, dairy-free, preservative-free, and additive-free. Leah McGrath, RD, LDN, corporate dietitian at Ingles Markets in Asheville, North Carolina, says there's more variety in the yogurt aisle than ever before. "There's certainly more variety in all areas. Flavor, style, and format: custard, whipped, side-by-side cups with toppings, drinkable, and plant-based," McGrath says. In addition, there are landmines in the dairy aisle as manufacturers compete for consumers' attention. For example, "Greek yogurt's claim to fame, due to its higher-protein and lower-sugar message, has been muddied by large brands [that have been making] Greek yogurt sweeter, trying to copy the taste of traditional yogurt to attract more customers," McGrath says. The following summaries of different yogurt varieties outline what makes each one unique. What it is: "Australian yogurt is unstrained. It's made with whole milk and typically sweetened with honey. It has a velvety, creamy texture and has been described as in between Greek-style and traditional-style yogurts. It's lower in protein than Greek yogurt but higher than traditional yogurt," Al Bochi says. Popular brands: noosa and Wallaby. Nutrition information: One 8-oz cup of noosa plain yogurt contains 240 kcal, 13 g fat, 8 g sat fat, 18 g carbohydrate, 15 g sugars, and 14 g protein. What it is: "French-style yogurt is a thick unstrained yogurt [in keeping with] the trend of full-fat dairy," Steinbach says. Each serving is individually cultured for eight hours in the same glass pot from which consumers will eat. Although it's often compared with Greek yogurt because of its thick consistency, Kristen F. Gradney, MHA, RDN, LDN, a dietitian in Baton Rouge, Louisiana, says French yogurt has less protein than Greek and can contain more sugar. Gradney recommends plain French yogurt instead of varieties containing fruit. Popular brands: Oui by Yoplait. Nutrition information: One 5-oz container of Oui plain yogurt contains 130 kcal; 8 g total fat; 5 g sat fat; 8 g carbohydrate; 6 g sugars; and 5 g protein. What it is: Greek yogurt is a thick, creamy yogurt that's been strained to remove the whey. Most Greek yogurts have twice the protein of regular low-fat yogurt. "You can often find full-fat, low-fat, and fat-free varieties," Gradney says. Popular brands: Chobani, FAGE, and Dannon Oikos. Nutrition information: One 8-oz container of Dannon Oikos plain yogurt contains 190 kcal; 9 g fat; 6 g sat fat; 9 g carbohydrate; 9 g sugars; and 20 g protein. What it is: Icelandic yogurt, also known as skyr, is a strained yogurt that's creamier and thicker than Greek yogurt. In fact, it takes almost four cups of milk to make one cup of Icelandic yogurt, which is why it contains more protein than regular yogurts. Popular brands: Smári, Ísey Skyr, and siggi's. Nutrition information: One 5.3-oz cup of siggi's plain skyr yogurt contains 90 kcal; 0 g fat; 0 g sat fat; 6 g carbs, 4 g sugars, and 16 g protein. What it is: Al Bochi describes kefir as a fermented milk drink. "It is produced when milk and kefir grains (cultures of bacteria and yeast) interact," she says, adding that it has a tart, tangy taste. Strained kefir, available in spoonable cups, has a creamy texture similar to Greek yogurt with up to twice as many probiotics. Al Bochi says kefir can be found in full-fat or nonfat and plain or flavored varieties. Popular brands: Lifeway, The Greek Gods, and Ludwig Dairy. Nutrition information: One 6-oz cup of Lifeway plain spoonable kefir contains 100 kcal; 1.5 g fat; 1 g sat fat; 7 g carbohydrate; 2 g sugars; and 13 g protein. What it is: Plant-based yogurts are made from soy, almond, cashew, hemp, flax, or coconut milk. Popular brands: Silk, Stonyfield O'Soy, and Kite Hill. Nutrition information: One 8-oz cup of Silk plain soy yogurt contains 140 kcal, 5 g fat; 0.5 g sat fat; 13 g carbohydrate; 7 g sugars; 9 g protein. The nutrient profiles of plant-based yogurts vary widely because they're made from different foods, and companies have dissimilar fortification processes.17 "Almond- and coconut-based yogurts have the least protein," Al Bochi says. "The protein content of soy yogurt is comparable to dairy yogurt. Not all plant-based yogurts are fortified with calcium and vitamin D, so it's important to look for brands that contain these nutrients." What it is: Traditional American-style yogurt is unstrained and made from whole, low-fat, or nonfat milk. Because it's unstrained, Al Bochi says it's lower in protein compared with strained varieties such as Greek yogurt. Traditional yogurt has a smooth and creamy texture. Popular brands: Yoplait, Stonyfield, and Dannon. Nutrition information: One 8-oz cup of Dannon plain yogurt contains 120 kcal; 0 g fat; 0 g sat fat; 18 g carbohydrate; 15 g sugars; and 10 g protein. Because there are so many types of yogurt, remind clients that all yogurts aren't created equal—especially when it comes to live cultures. Looking for the phrase "contains active cultures" or "living cultures" on the carton will ensure they're getting live cultures. In addition, the presence of the National Yogurt Association's "Live & Active Cultures" seal insures that the yogurt contains live cultures. To reduce added sugar intake, Al Bochi encourages clients to choose plain yogurts and sweeten them with honey or fruit such as berries. For those who buy plant-based yogurts, she reminds them to look for brands fortified with vitamin D and calcium. And for those who wish to increase their protein intake, Al Bochi encourages them to choose Greek-style yogurts. Icelandic, French, and Australian are other higher-protein options. Moreover, remind clients to read the nutrition facts panel and check the serving size. Yogurt containers range from 4- to 8-oz servings, although the FDA RACC (recommended amount customarily consumed) is 170 g, approximately 6 oz, which is the labeling standard. Gradney encourages clients to always read the ingredients list and choose yogurt with no added sugars and few ingredients. A long ingredient list may be an indicator the yogurt contains some less-than-healthful substances. She also recommends that clients experiment with several yogurt varieties to determine which is best for cooking or use as a condiment, or to simply satisfy the taste buds. "High-fat yogurt is good for cooking. There's less chance of curdling and it creates a silky texture," Gradney says. Dietitians should encourage clients to eat yogurt daily to help close the nutrient intake gap on calcium, potassium, and vitamin D—three of the four nutrients of public health concern identified by the DGA. Yogurt's live and active cultures make it a more easily digestible option for people with lactose intolerance. Yogurt is a versatile, nutrient-dense food and is available in many forms to meet the taste preferences of consumers. — Constance Brown-Riggs, MSEd, RD, CDE, CDN, is author of Diabetes Guide to Enjoying Foods of the World, a convenient guide to help people with diabetes enjoy all the flavors of the world while still following a healthful meal plan. * Brown-Riggs reports the following relevant disclosure: She serves as nutrition adviser for Danone North America. 1. Freitas M. The benefits of yogurt, cultures, and fermentation. In: Floch MH, Ringel Y, Walker WA, eds. The Microbiota in Gastrointestinal Pathophysiology: Implications for Human Health, Prebiotics, Probiotics, and Dysbiosis. London, UK: Academic Press; 2017:209-223. 2. US Department of Agriculture, US Department of Health & Human Services. Scientific Report of the 2015 Dietary Guidelines Advisory Committee. http://health.gov/dietaryguidelines/2015-scientific-report/PDFs/Scientific-Report-of-the-2015-Dietary-Guidelines-Advisory-Committee.pdf. Published February 2015. Accessed April 25, 2018. 3. Westerterp-Plantenga MS, Lemmens SG, Westerterp KR. Dietary protein — its role in satiety, energetics, weight loss and health. Br J Nutr. 2012;108(Suppl 2):S105-S112. 4. Heaney RP, Layman DK. Amount and type of protein influences bone health. Am J Clin Nutr. 2008;87(5):1567S-1570S. 5. Mozaffarian D, Hao T, Rimm EB, Willett WC, Hu FB. Changes in diet and lifestyle and long-term weight gain in women and men. N Engl J Med. 2011;364(25):2392-2404. 6. Webb D, Donovan SM, Meydani SN. The role of yogurt in improving the quality of the American diet and meeting dietary guidelines. Nutr Rev. 2014;72(3):180-189. 7. Wang H, Livingston KA, Fox CS, Meigs JB, Jacques PF. Yogurt consumption is associated with better diet quality and metabolic profile in American men and women. Nutr Res. 2013;33(1):18-26. 8. Savaiano DA, Boushey CJ, McCabe GP. Lactose intolerance symptoms assessed by meta-analysis: a grain of truth that leads to exaggeration. J Nutr. 2006;136(4):1107-1113. 9. Sager K. Trending now in the US: whole milk yogurt. LinkedIn website. https://www.linkedin.com/pulse/trending-now-us-whole-milk-yogurt-ingredia-dairy-experts. Published October 27, 2017. Accessed April 25, 2018. 10. Guo J, Astrup A, Lovegrove JA, Gijsbers L, Givens DI, Soedamah-Muthu SS. Milk and dairy consumption and risk of cardiovascular diseases and all-cause mortality: dose-response meta-analysis of prospective cohort studies. Eur J Epidemiol. 2017;32(4):269-287. 11. Holmberg S, Thelin A. High dairy fat intake related to less central obesity: a male cohort study with 12 years' follow-up. Scand J Prim Health Care. 2013;31(2):89-94. 12. What's your flavor? Noosa website. http://www.noosayoghurt.com/our-products/. Accessed April 25, 2018. 13. Yoplait leverages heritage recipe to bring French style yogurt to U.S. Multivu website. https://www.multivu.com/players/English/8127351-general-mills-oui-by-yoplait-french-style-yogurt/. Published June 26, 2017. Accessed April 25, 2018. 14. Our products. Oikos website. http://www.oikosyogurt.com. Accessed April 25, 2018. 15. Our products. siggi's website. https://siggis.com/products/#?productSection=skyr. Accessed April 25, 2018. 16. Kefir cups. Lifeway website. http://lifewaykefir.com/kefir-cups/. Accessed April 25, 2018. 17. Turner H. Vegan yogurts: a comparative analysis. Today's Dietitian website. http://www.todaysdietitian.com/news/exclusive0316.shtml. Published March 2016. Accessed April 25, 2018. 18. Silk. Silk website. https://silk.com/spoonfulofsilk. Accessed April 25, 2018. 19. Our yogurt. Dannon website. http://www.dannonyogurt.com/yogurt/. Accessed April 25, 2018.